First published in 1990, The Economics of Salmon Aquaculture was the first book to systematically analyse the salmon aquaculture industry, from both a market and production perspective. Since publication of the first edition of this book, the salmon aquaculture industry has grown at a phenomenal rate, with salmon now being consumed in more than 100 countries worldwide. This second edition of a very popular and successful book brings the reader right up to date with all the major current issues pertaining to salmon aquaculture. Commencing with an overview of the production process in aquaculture, the following chapters provide in-depth coverage of the sources of the world’s supply of salmon, the growth in productivity, technological changes, environmental issues, markets, market structure and competitiveness, lessons that can be learnt from the culture of other species, optimal harvesting techniques, production planning, and investment in salmon farms. 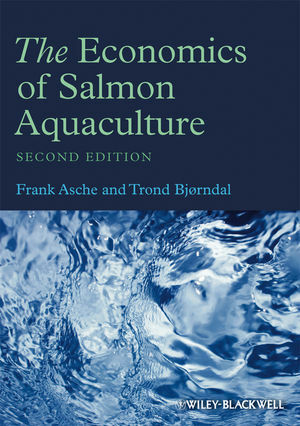 Written by Frank Ashe and Trond Bjørndal, two of the world's leading experts in the economics of aquaculture, this second edition of The Economics of Salmon Aquaculture provides the salmon aquaculture industry with an essential reference work, including a wealth of commercially important information. This book is also a valuable resource for upper level students and professionals in aquaculture and economics, and libraries in all universities and research establishments where these subjects are studied and taught should have copies of this important book on their shelves. Frank Asche is Professor at the Department of Industrial Economics, University of Stavanger, Norway. Trond Bjørndal is Professor and Director of the Centre for the Economics and Management of Aquatic Resources (CEMARE), University of Portsmouth, UK, and Professor II, Aalesund University College, Norway. 2 The Production Process in Aquaculture. 3 The Supply of Salmon. 3.3 Regulation of salmon aquaculture. 3.4 The growth of large multinational companies. 4 Productivity Growth and Technological Change. 4.3 Structure of production costs. 4.6 Diseases and increased survival rates. 4.9 Catching up: regional differences. 4.10 Productivity development in Norway relative to other producers. 4.11 Cost reductions in the supply chain. 5.1 The fi sh meal trap. 6.1 The European Union markets. 6.2 The Japanese salmon market. 6.3 The United States salmon market. 7 Competitiveness and Market Structure. 7.1 What is a market? 7.3 The size of the market. 8 Lessons for Other Farmed Species. 8.2 Lessons from other farmed species. 9 Optimal Harvesting of Farmed Fish. Appendix: optimal harvesting of farmed fish. 10 Production Planning in a Salmon Farm. 10.1 Cash fl ow analysis. 10.2 Smolt release and biomass growth. 11 Investment in a Salmon Farm. 11.4 Investing in a new aquaculture company. 11.6 Buying a fish farming company.